Information on Topics and Speakers can be found Here. Introducing our new mugs! Each mug represents one of our Programs: Spring Fling, Bulbs for Bucks, Kitchen & Garden, Education and RePlant Bucks. They make great gifts; buy them individually or as a set. 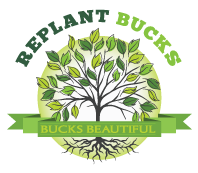 Bucks Beautiful’s newest initiative, RePlant Bucks, has a goal of planting 10,000 trees in locations throughout Bucks County hard hit by the devastation of the emerald ash borer to begin a replacement program for the ash trees that have been killed by the borer. For more information about this important program, visit our program page. To Donate now, click here and select RePlant Bucks. Replant Bucks – It is heartbreaking to witness the recent devastating effects of disease and invasive insects, such as the Spotted Lanternfly and the Emerald Ash Borer, on the tree canopy in Bucks County. Through Replant Bucks, our newest initiative, Bucks Beautiful is committed to lead the way in facilitating the reforestation of our local communities and working with the other local organizations in their efforts to replant. 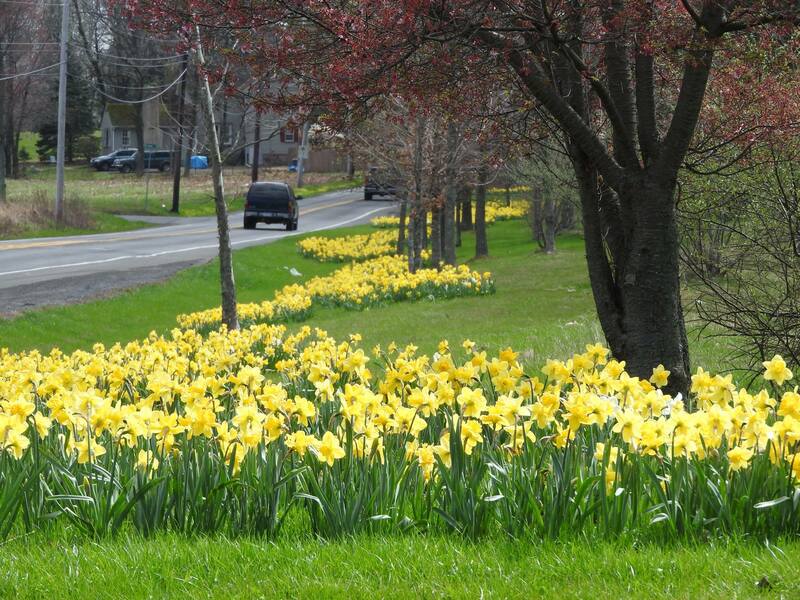 Bulbs for Bucks – Over 1,300,000 daffodils planted throughout Bucks County, including an additional 100,000 planted this fall. 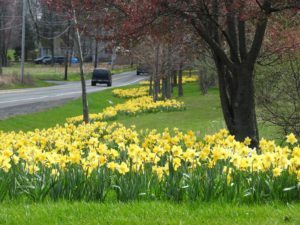 This past spring we were especially proud to have blooming daffodils honoring many who have come before us: our fallen veterans at Washington Crossing Memorial Cemetery, the Chalfont Cemetery, the Pearl S. Buck House, as well as celebrating 100 years of scouting in Lenape Park in Sellersville. Maintain Bucks County Public Gardens – Provide support for the maintenance of local gardens such as those at the YMCA, Delaware Valley University and CB West. Pop-up Parks – Bringing public awareness to the need for more green space in our urban areas with the wonderfully successful pop-up parks. Kitchen & Garden Tour – Our annual fundraising event showcasing the work of local builders, landscapers and homeowners who help create beautiful Bucks County homes and gardens. Community Garden Grants – Since 1991 we have been providing grants for the development of community gardens throughout Bucks County. Educational Seminars – We continue to partner with Delaware Valley University with our popular spring and fall gardening community educational lecture series. Horticultural Scholarships – Bucks Beautiful is committed to educating our youth, offering scholarships to students majoring in horticultural related fields. As a 501(c)3 non-profit organization, we ask you to please join us in bringing an even bigger Bucks Beautiful presence to our community with your tax-deductible contribution. It’s easy to contribute by making a secure online donation at www.bucksbeautiful.org, or use the enclosed form to send your contribution to Bucks Beautiful. Your continued support means the world to us, and we look forward to showing you how! Thank you in advance for your kind consideration. Visit our convenient, secure online contribution page to Donate Today! Or, make your gift by mail by sending your check to: Bucks Beautiful, 85 E. State Street, Doylestown, PA 18901. Your continued support means the world to us, and we look forward to showing you how! THANK YOU FOR YOUR SUPPORT! All contributions are tax deductible to the fullest extent allowed by law. Bucks Beautiful is a 501(c)(3) Corporation. Bucks Beautiful tax id #: 23-2657994. The oﬃcial registration and ﬁnancial information may be obtained from the Pennsylvania Department of State by calling toll-free within Pennsylvania by calling 1.800.732.0999. Registration does not imply endorsement. PLEASE SUPPORT THE SPONSORS WHO SUPPORT US! 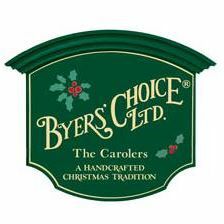 CLICK HERE TO VISIT OUR SPONSOR PAGE. We are most grateful to our major contributors for their generous support!